In Boys Should Be Boys, one of our most trusted authorities helps parents restore the delights of boyhood and enable today’s boys to become the mature, confident, and thoughtful men of tomorrow. Boys will always be boys–rambunctious, adventurous, and curious, climbing trees, building forts, playing tackle football, and pushing their growing bodies to the limit as part of the rite of passage into manhood. But today our sons face an increasingly hostile world that doesn’t value the high-spirited, magical nature of boys. 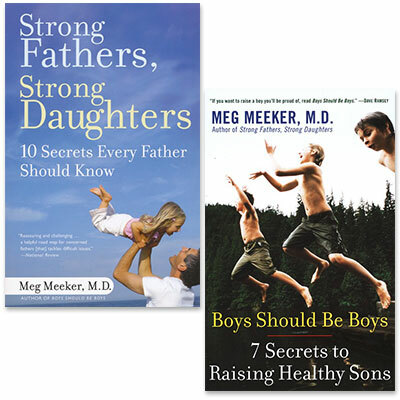 In a collective call to let our boys be boys, Dr. Meg Meeker explores the secrets to boyhood. In today’s increasingly complicated world, it’s often difficult for parents to connect with their daughters–and especially so for fathers. In this unique and invaluable guide, Dr. Meg Meeker, a pediatrician with more than twenty years’ experience counseling girls, reveals that a young woman’s relationship with her father is far more important than we’ve ever realized. To become a strong, confident woman, a daughter needs her father’s attention, protection, courage, and wisdom. Dr. Meeker shares the ten secrets every father needs to know in order to strengthen or rebuild bonds with his daughter and shape her life–and his own–for the better.